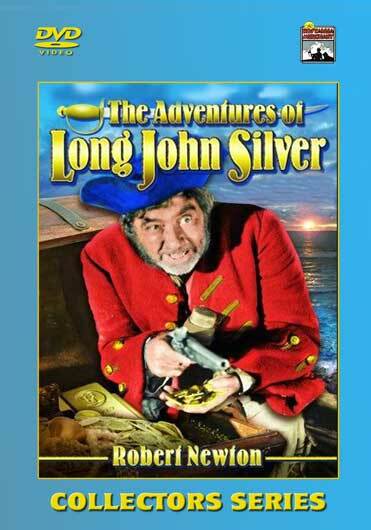 The Adventures of Long John Silver is a TV series about the Long John Silver character from Treasure Island. It was made in 1954 in color in Australia for the American and British markets before the development of Australian television. Based on the Robert Louis Stevenson pirate character from his novel ‘Treasure Island’, and set at Porto Bello on the Spanish Main, the series featured English actor Robert Newton in the title role. Newton had previously played the same part in the 1950 Disney movie Treasure Island. This 4 DVD Set includes 14 excellent quality color episodes from film transfers. Devil’s Stew, Sword of Vengeance, Turnabout, Ship of the Dead, Eviction, The Pink Pearl, The Necklace, Miss Purity’s Birthday, Pieces of Eight, Dead Reckoning, Dragon Slayer, Tale of a Tooth, Orphan’s Christmas, Execution Dock.